What is my Course Mail address? Your MUN email (@mun.ca) address is a standard email address. You can send and receive messages from any email client, including Gmail, Hotmail, and Yahoo. Your Course Mail (@online.mun.ca) address is internal to Brightspace (D2L) and can only be accessed by logging into online.mun.ca. This address can only send and receive messages from other @online.mun.ca accounts. If you attempt to send a message to an email address outside Brightspace (D2L), you will get a message that says “no external permission” and your message will not be sent. 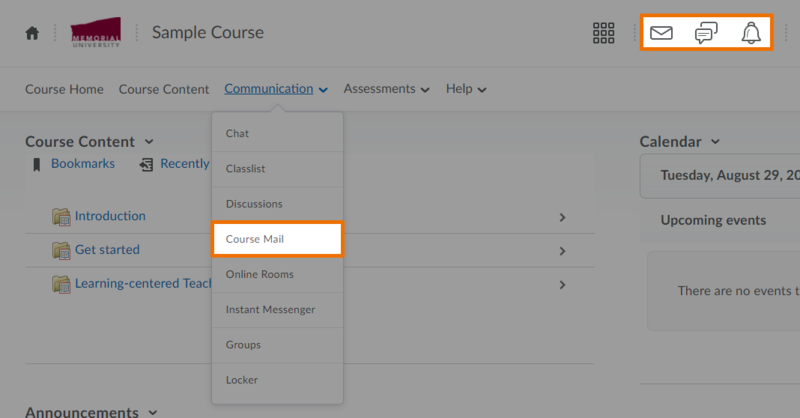 You can access your course mail on the Communications menu of your course, or at anytime from the Brightspace Navigation menu on the top. 2) Enter the recipient’s email address in the To field. Click Address Book to locate an address from your Address Book. Remember: you can only send emails to other @online.mun.ca addresses. 3) Compose your message in the Body field. You can enter a brief description of your email in the Subject line. You can also use the Spell Checker to check your email for misspellings. 1) From the Compose New Message page, create a new email as usual. 2) In the Attachments area, click Browse and select the file you want to attach. If you are using a supported browser, you can also drag and drop attachments from your desktop. If you do not know a classmate’s course mail address, you can still send them a message by clicking on Classlist (from the Communication drop down menu), and clicking on the name of the individual you wish to contact. This will automatically open a Compose New Message window with their course mail address in the “To” field. From your Inbox, click Folder Management. You will be brought to a screen that lists your current Course Mail folders. To create a new folder, click New Folder. You will be prompted to name the folder and decide if you would like to nest it under a Parent Folder. Enter this information and click Save. You should now see your new folder under the Folder List on the left side of the screen. You can move course mails to a folder by selecting the checkbox next to the mail(s) you wish to move and selecting the appropriate folder from the “–Move To–” dropdown menu.